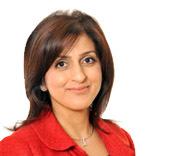 Asma Bajawa is the Founder and Managing Director of PeopleFirst HR Consultancy. Born and bred in the UK, Asma started her career with British Airways where she spent 22 years working in different aspects of the business but predominately in HR & Training and Development. 10 years ago, Asma moved to the UAE where she held a number of senior HR Directorship roles before setting up PeopleFirst. Since then she has spearheaded the company to become one of the leading HR consultancies in the region. Her business acumen, enthusiasm and ability to understand and work successfully with different cultures has helped her to build a strong reputation across the region. She has gained the respect of many senior executives and Board members across a wide range of industry sectors in the government, semi government and the private sector. She has successfully lead large transformation projects and acquisitions by supporting organisations to manage people and change through an integrated approach. Asma is respected as an HR professional who is able to challenge and influence at senior levels. Her ability to raise HR’s profile in numerous organisations is testimony to her understanding of how HR really adds value to a business. Asma is a Fellow of the CIPD and has an MBA from Kingston University in the UK.